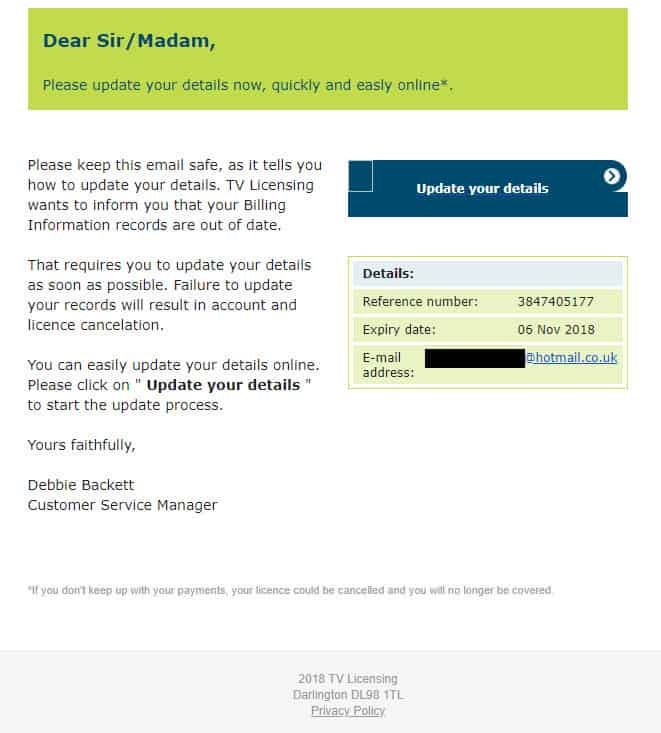 Some UK residents are receiving phishing emails purporting to be from the country’s TV licensing department. The fraudulent email states that the receiver’s billing information records are out of date and need to be updated. The email includes a prominent link to a near-identical clone of the real TV licensing website. Once the victim submits this information, it goes straight to the scammers. The credit card information is probably most valuable to the criminal, as it can be used for direct financial gain. The other information could be used for identity fraud. The mother’s maiden name, in particular, remains a common if insecure means of verifying an account holder’s identity. 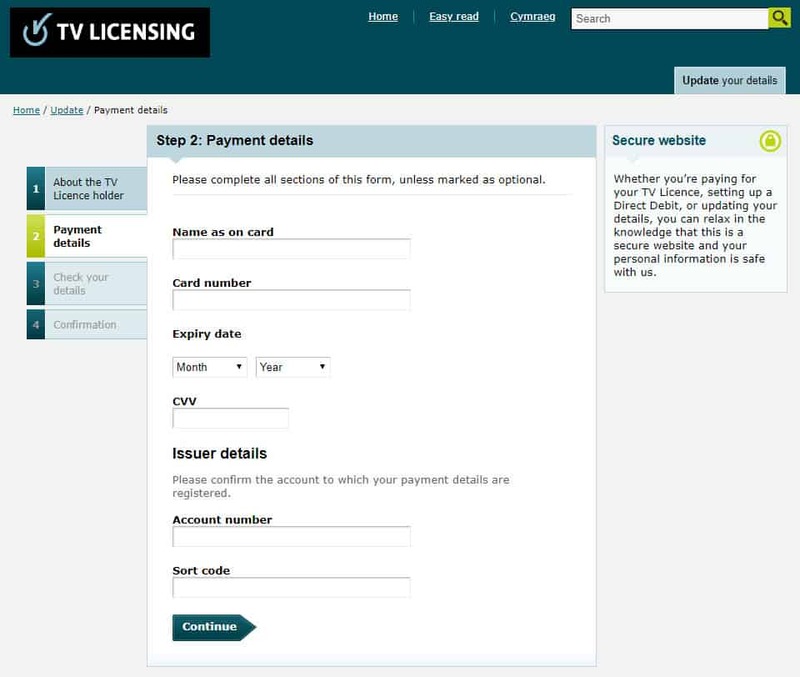 The UK’s TV licensing department never receives anything on its end, and there’s little recourse for victims who fall for the scam. If you receive such an email, you should delete it. If you’d like, you can first report it to the authorities. The scam is reminiscent of a similar phishing campaign in September wherein the email claimed victims were owned a refund or that their payment hasn’t gone through. The email address is associated with the domain servicelive.com, which appears to be a house call service for handymen employed by Sears in the US. We suspect the email account or the email server was hacked. Scammers might prefer to use a hacked legitimate domain for phishing because the emails are less likely to get blocked by a spam filter. The phishing URL contains two clues that should cue you into the fact that it’s fake. The first is the lack of HTTPS, which indicates that the site doesn’t have a valid SSL certificate. HTTPS ensures that all the data sent between the site and your device is encrypted and verifies that the website is who it says it is. Never enter personal information into a website without HTTPS, whether it’s legitimate or not. The second clue is the subdomains—all the stuff before “skeercbc.com”. The subdomain(s) “tvlicensing.co.uk.update.your.details.online.database741727882” are subservient to skeercbc.com. Website operators can create as many of these subdomains as they want and name them whatever they want. Copying legitimate URLs into a subdomain to make it look like the real thing is a common tactic used in phishing, as you can see here. The giveaway is in the use of periods instead of slashes. To spot it, look for the first forward slash (‘/’) after “http://”. Whatever comes just before that slash is the top level domain (.co.uk), and just before that is the website domain, “skeercbc”. Skeercbc.com is a website registered in the UK in May 2018. It claims to be a construction consultancy and appears to be legitimate, in which case it may not realize a hacker has used its subdomain to create a phishing site. We’ve contacted both ServiceLive.com and Skeercbc.com to inform them of the issue. While not always indicative of phishing, scammers often try to instill a sense of urgency in their victims to push them into making mistakes. In this case, the email threatens to cancel the license and account of the victim if their billing information is not updated. The email addresses the recipient as “Sir/Madam”, even though the TV Licensing folks would certainly have license holders’ names. It also doesn’t include an account number or any other identifiable information, which is a sign that this same email is being sent out to a large number of recipients in the hopes of tricking just a few.